Is the poppy a political symbol? 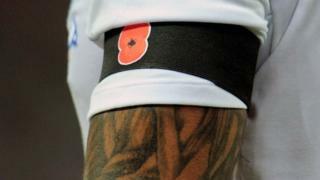 Football's governing body, Fifa, has turned down a request from England and Scotland for players to wear armbands featuring poppies on Armistice Day, the Scottish Football Association says. Does the design really breach a ban on "political" symbols, asks Stephen Fottrell. The poppy is worn every November to commemorate members of the armed forces who gave their lives in war, and British sports teams have traditionally joined in by adding a poppy to their kit. The English and Scottish football associations had hoped to get permission for their players to wear poppies on their shirts during their World Cup qualifier on Armistice Day (11 November). But Fifa bans "political, religious or commercial messages" from being used on national teams' shirts, and the Scottish FA says the world governing body is "sticking to the letter of the law". However, both football associations hope to change Fifa's mind. There's no question of the poppy being religious or commercial, so presumably Fifa's concern is that it can be seen as political. The Royal British Legion (RBL), organiser of the annual poppy appeal, insists the poppy is not a political statement or "a sign of support for war", but instead a symbol of "remembrance and hope". "We see no reason why the poppy should be banned from players' shirts as it is not a political symbol," a spokeswoman says. It's not the first time this question has arisen. In 2011, following a public outcry, a solution was found in which England, Scotland and Wales teams were allowed to wear poppies on black armbands. The RBL expects a similar compromise to be reached this year, the spokeswoman says. But Lucy Noakes, a social and cultural historian at the University of Brighton, thinks it's not entirely accurate to depict the poppy as apolitical. Despite the fact that it was introduced in 1921 for charitable purposes - to raise money that would help World War One veterans with employment and housing - it has "been politicised almost since its inception", she says. In the 1930s the Peace Pledge Union, who believe red poppies are associated with "military power and the justification of war" started selling white poppies. The white poppy experienced a resurgence in the 1980s while the Campaign for Nuclear Disarmament was at its height, Noakes says. But she acknowledges that most of those who wear poppies do not regard it as a political act. Many will see it as a way to remember loved ones, for instance. "It's not the same as wearing a badge with an overt political statement," Noakes says. "It's more complicated. It has different meanings to different people." Among those today who argue that the poppy is political is Harry Leslie Smith, a 93-year-old World War Two RAF veteran, who has not worn a poppy since 2013 because he believes "the spirit of my generation has been hijacked" by today's politicians to "sell dubious wars" in Afghanistan and Iraq. Another is West Bromwich Albion and Republic of Ireland midfielder James McClean, who refuses to wear a poppy, arguing that it represents all the conflicts the UK has taken part in. He cites in particular "the history where I come from in Derry" - the Northern Irish city in which British paratroopers killed unarmed civilians on "Bloody Sunday" in January 1972. In 2010, a group of Celtic supporters unfurled banners objecting to poppies on their team's kit, citing British interventions in Afghanistan, Ireland and Iraq. The club apologised for the fans' behaviour. The poppy at the centre of that objection, the Scottish version, is actually different from the one used in the rest of the UK, with four lobed petals instead of two - and no leaf. But it symbolises the same thing, whether you take that to be remembrance and hope, or something more politically charged. What's so different about the Scottish poppy?